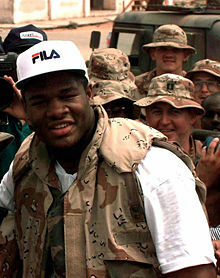 Riddick Bowe (born August 10, 1967) is an American amateur boxer. He won a Silver medal at the 1988 Summer Olympics. He later became a Heavyweight professional boxer. He defeated other boxers like Evander Holyfield and Andrew Golota. The latter was disqualified for giving too many low blows to Bowe in 1996. Bowe was born in Brooklyn, New York City. ↑ "Fighter Remains a Champion Optimist". New York Times. Retrieved Jul 7, 2016. This page was last changed on 31 August 2017, at 10:46.